If you want to get rid of your wrinkles with a safe, natural solution, RADIESSE™ may be for you. At Florida Cosmetic Surgery Center, our Plastic Surgeons perform Radiesse injections for patients in the Orlando region to provide a safe, long-lasting, natural looking wrinkle filler. By supplementing your skin’s own depleted collagen with Radiesse, we can smooth out wrinkles and most scars. We can also improve the appearance of deeper frown lines and nasal furrows. Radiesse is a safe, effective, time-tested, non-surgical wrinkle treatment that provides immediate results. Radiesse treatments are performed in our office and take about fifteen to twenty minutes. Radiesse is injected into the wrinkle, through a tiny needle, and placed just under your skin. 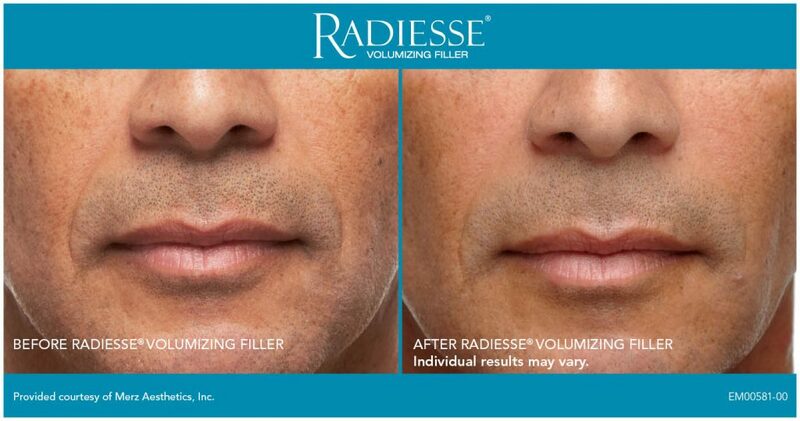 Unlike other fillers, Radiesse is not absorbed quickly by your system. Therefore, we do not need to over-fill the wrinkle. Your results are immediate and long lasting. After your Florida Cosmetic Surgeon performs Radiesse treatments, patients are up and around immediately. You can expect greatly improved wrinkles, enhanced cheeks or smoothed-out depressed scars. Any discomfort following the procedure can be controlled with medication. The treatment site may have a little swelling, which may last twenty-four to thirty-six hours depending on the area treated. There may be some slight bruising at the injection site, which can be covered with make-up. Depending on the area treated, most of your correction may last for twelve months or longer. Some touch-up treatments may be necessary. What our patients like the most about Radiesse is that they don’t have to come back every three to six months and they still look great! If you want to get rid of your wrinkles with a safe, natural solution, Radiesse may be for you.